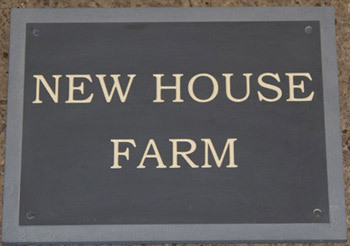 This is another popular size for a slate house sign - particularly useful if you need two lines of text or a larger house sign. Ideal for two or three lines of text and can be designed with or without a border. The sign to the right has a border in relief where the slate has been sand blasted away. Reasonably price house numbers in slate and granite. Lots of design ideas or you could come up with your own! You are not restricted to standard sizes. We cut slate to almost any size in 4 different thicknesses - 12mm, 20mm, 30mm & 50mm. We can include your own simple images. Although more expensive than other slate name plates, they can look very attractive and are just that little bit different. Also available for house numbers. Corian is a man made material made from stone dust and resin. It does look and feel much like slate. 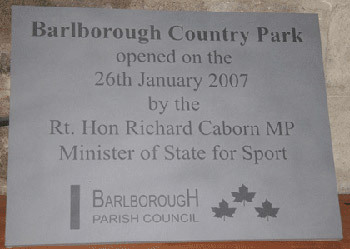 However the lettering can be much smaller and the surface is uniform, without the natural markings found in real slate. 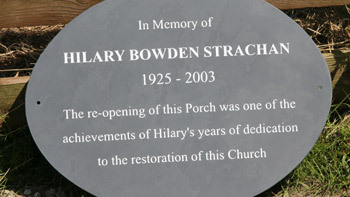 Granite name plates can look fantastic. The name plate to the right shows a gold paintfill on black granite. We have a number of different granites in 12mm, 20mm and 30mm thicknesses.